I have always had major hair woes primarily due to dryness and my wavy hair. My hair looks like a bird’s big nest unless I condition it well and use a ton of styling products and heat which damages it further. Nowadays, heat styling and hair coloring has become so common that frizz and dryness is a major issue. Recently I pre-lightened/ bleached my hair which has made it really dry and frizzy and my saviour has been the L’Oreal Professional Absolut Repair Lipidum Shampoo & Masque. If you have dry and damaged hair then you must read on. 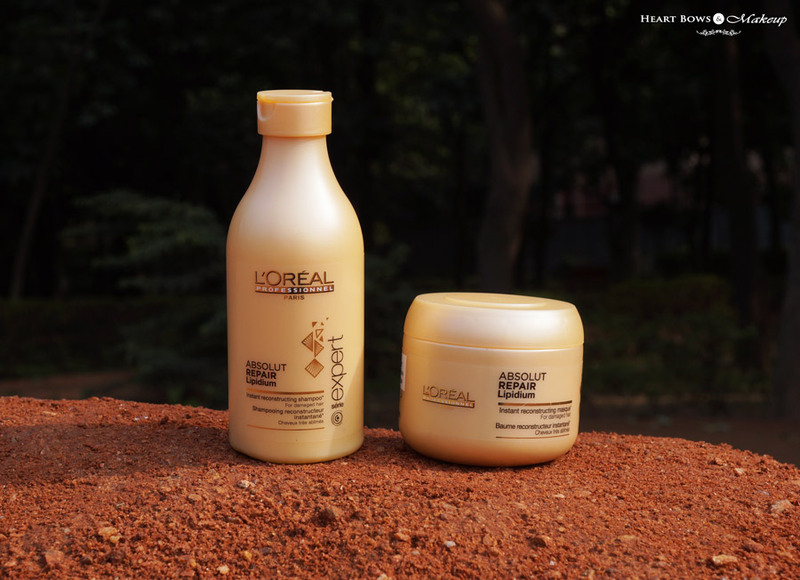 The L’Oreal Absolut Repair Lipidum Range aims to reduce the signs of damaged hair caused by heat styling, hair coloring, sun damage etc. The use of Lipidium Complex, comprised of Protective Lipids, Phyto-Kertain, Ceramide and Lactic Acid, strengthens and protects the hair fibre. 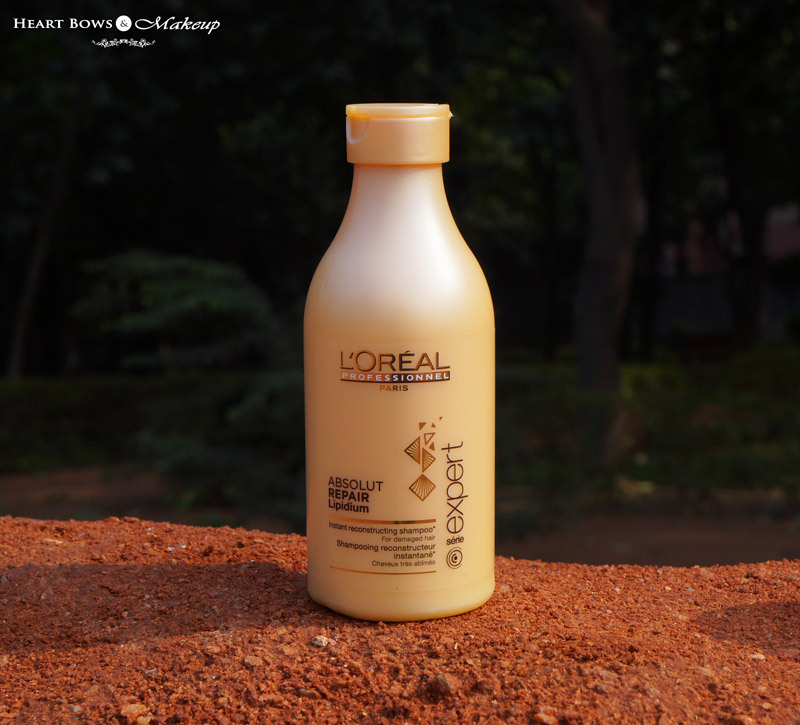 I have been using the L’Oreal Absolut Repair Shampoo & Mask for almost 2 months now and it has worked really well for me. 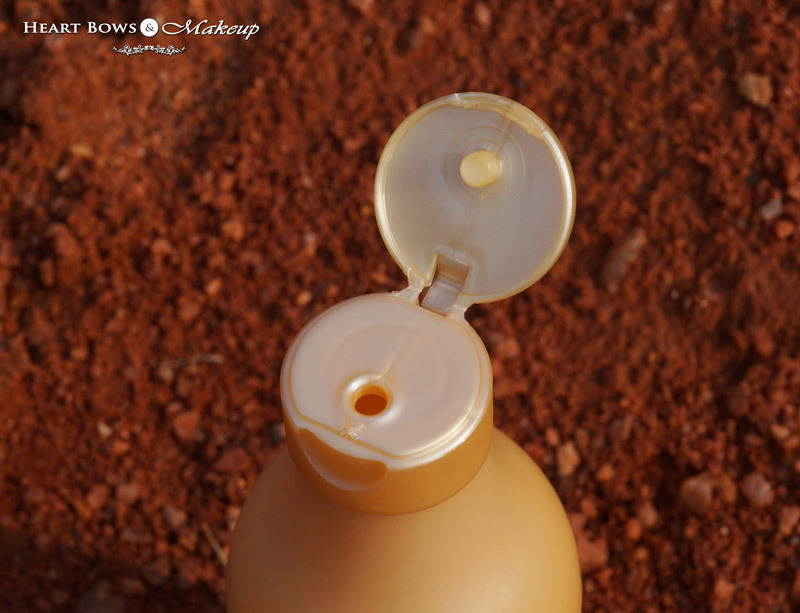 This L’Oreal Professional Shampoo For Damaged hair comes in a pale gold plastic bottle with a flip open cap. It has a sweet fragrance which I like but find it a bit too strong for my sensitive nose. The shampoo lathers quite well and effectively removes dirt and oil. I hate shampoos that do not lather well or you need to use alot of product to remove oil from the hair. You do need some extra quantity incase you oil your hair but not too much! My hair feels really soft and smooth after usage and I adore the fragrance which lasts for about 2-3 days and keeps my hair smelling good. I do find it a bit expensive so I suggest you buy those big 1.5 lts bottles which are more cost effective. Make sure you try out the smaller variant first to see if it suits your hair. I have been using the L’Oreal Professional hair care range for more than an year now and it has suited my hair much better than Schwarzkopf and even Kerastase hair care range! The L’Oreal Professional Absolut Repair Lipidum Mask/Conditioner comes in a pale gold tub with a screw on cap. 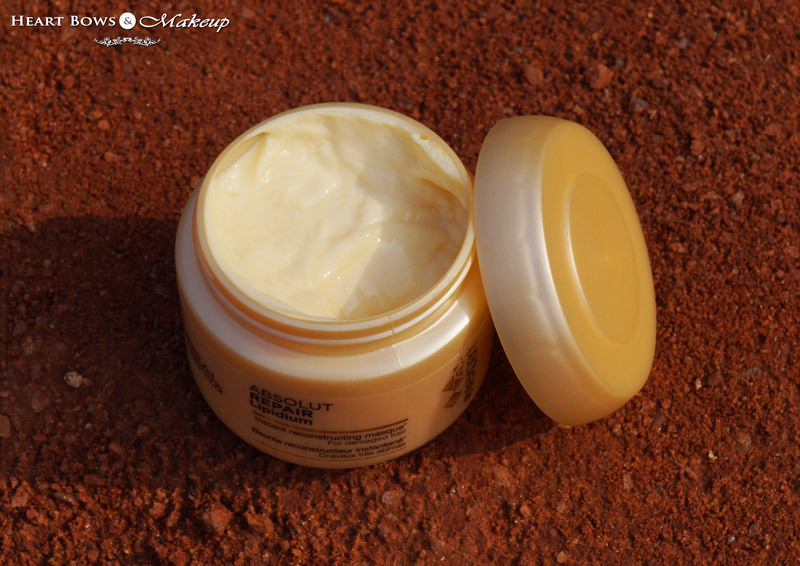 The masque is light yellow in color and feels like whipped butter in texture! I use this as a conditioner after every shampoo and also as a hair masque during my DIY hair spa every 2-3 weeks. The L’Oreal Professional Range doesn’t come with a separate conditioner for all their variants in India and you are supposed to use the masques as a conditioner so don’t be surprised if the SA gives you the masque tub when you ask for a conditioner. I take about a dallop for my medium length thick hair and massage it all over the roots and ends. Since my hair is quite unmanageable I do not mind if the masque weighs it down but if you have fine and limp hair then its best you avoid the roots and concentrate on the ends. I wash it off after 2-3 minutes. This adds shine to my hair and controls the frizz to a great extent! I have used the Liss Ultime & Cream Bath Hair Spa by L’Oreal Professional before but the Absolut Repair Masque works the best for my super dry and damaged hair. LOVE! 1) The shampoo is a bit expensive if you buy the smaller variants. 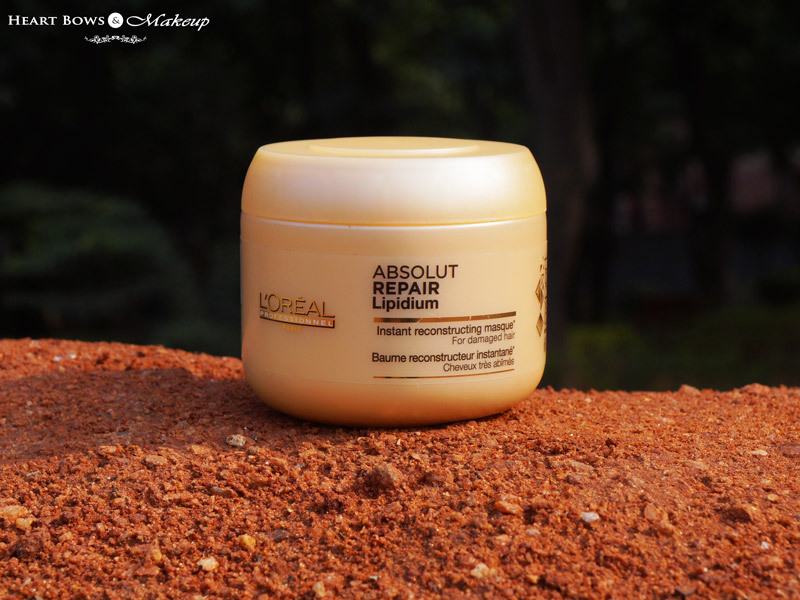 HBM Recommendation: The L’Oreal Professional Absolut Repair Lipidum Shampoo & Masque is the perfect combination for someone with dry and damaged hair. The duo has managed to reduce frizz, make my hair soft and much more manageable. This has worked even better than the Kerastase Oleo Relax range which is saying something! Highly recommended for those with dry, damaged and chemically treated hair! * PR Samples. However, my opinion is honest and unbiased. Win a Philips Air Straightener This Valentine’s Day!